“Happiness is reached when what we think, say and do, is in harmony.” (Gandhi). YOR Health came in a very hard time of my life. My partner and I were going through a twin pregnancy that didn’t come to term, her unjustified dismissal for being one week in the hospital, that’s how it works in town halls, I was wearing a cast because I had a broken metacarpal and I had issues with my shoulder that prevented me from exercising for 5 months. I had tried all kinds of products besides exercising, and I truly never got the results I wanted. I’ve always struggled with overweight, and honestly, no fatty is happy. I felt like in a jail, no matter how much I worked out or how many changes I did to my diet, there was no way out. Besides, there were already indications of diabetes in my family, and my mother had passed away due to a stomach cancer. This was creating a very big conflict for me because I didn’t know what to do or how to get out of that jail. When I started the Challenge on January 1st, 2013, exposing my body wasn’t easy for me, uploading my photos for everybody to see them was a challenge itself. The changes I’ve had are evident. I didn’t lose weight for the first weeks, but I dropped three sizes. The best you can do is use all the product because by logic, if you have a good digestive health, you’ll have a good nutrition and your weight problems will go away. I have the products at breakfast and at dinner, and I can honestly say that now I’m aware of what I eat and it has already become a lifestyle. Upon rising I have Probiotics. For breakfast I have a super cocktail made of MRP, chocolate please, SuperGreens, Fiber and Berry Blast, having a Repair and Vitamins with it. At lunch I have whatever I want, without forgetting to take the Digest Ultra. I am a product of the product, truly. What else can I say? The products are reliable and the NDS gives you the confidence that what you are taking will really help you. Blessed enzymes, I’ve lost 24 kg / 52.91 lbs so far, and I am happy!! I’ve experienced many changes in my body and in my life, and they are reflected in what I am becoming, a new version of me in every aspect. I feel I have a new light and a strength renewed by all the changes I’ve achieved in my attitude and in the way I dress because now I can wear clothes I had in the closet waiting to magically fit overnight, but no, change happens step by step, and with a lot of discipline and consistency. The most important part of the Challenge, beyond losing weight or not, is the radical change in yourself and the person you become. Thanks to the Challenge I’ve accomplished blue belt in Brazilian jiu-jtisu! Thank you to all the amazing people I’ve met, to my Uplines for showing me this wonderful world of YOR Health, to Gaby Luna, Benjamin Porthoz and Javier Villalobos, for having confidence in me and for teaching me to always remain teachable, I love you! But especially, thanks to my wife Mariana Topete Monteagudo, who is my daily support and strength. I love you. My body keeps changing. I’ve regained my confidence and I’m retaking control of my life. I have nothing left but to thank life, the universe, and the force!! 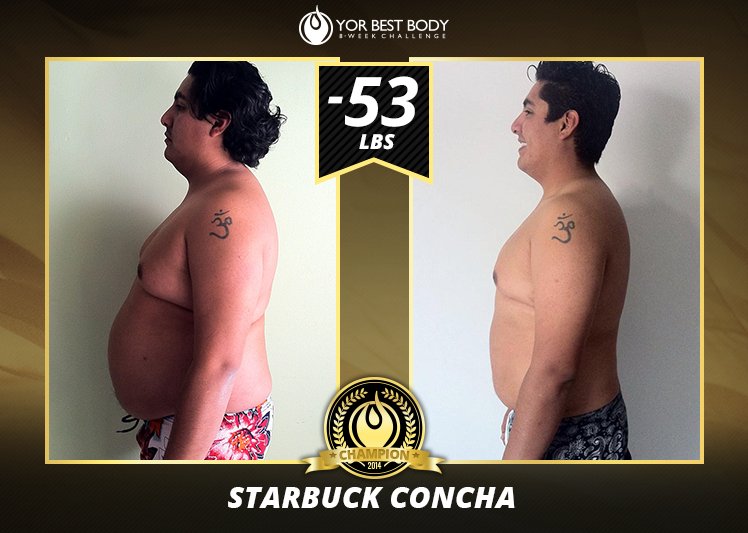 Thank you YOR Best Body Challenge! !